Australian tree fern is a large, robust, attractive tree fern popular in cultivation in temperate regions. The common name 'Australian tree fern' may also be used to refer to Cyathea cooperi and Cyathea australis. In its native habitat of south-eastern Australia, Dicksonia antarctica often dominates wet, shady gullies and frequently grows in extensive stands. Its fibrous trunk forms an excellent substrate for other plants, including mosses, ferns and orchids. The trunk is formed from a slender stem surrounded by a mass of fibrous roots, enabling the plant to support itself. Dicksonia antarctica is similar in appearance to D. fibrosa from New Zealand. Adult plants of D. antarctica generally shed old leaves (also known as fronds) from the canopy, in contrast to D. fibrosa which retains its leaves to form a dense skirt around the trunk. Restricted to Australia, where it grows in south-eastern Queensland, eastern New South Wales, Australian Capital Territory, southern Victoria and Tasmania. A relict population grew in south-east South Australia but is now extinct. Dicksonia antarctica occurs up to about 1,000 m above sea level. Forests and woodlands cover just 19% of Australia (147 million hectares), but about 70% of the country's plants grow there. Dominated by gum trees ( Eucalyptus ), wattles ( Acacia ) and paperbarks ( Melaleuca ), many species of tree fern also thrive in these habitats. Dicksonia antarctica is the most common tree fern in Australia. Of the two most numerous genera of tree ferns, Cyathea and Dicksonia, Dicksonia can be recognised by its smooth leaf bases (which are covered in rusty-brown hairs, not scales), the fibrous matted roots that cover much of the trunk and the marginal position of the spore clusters. A slow-growing tree fern, forming a thick, sometimes massive trunk up to 15 m tall. The trunk is usually solitary but may produce offsets, and is densely covered in matted, brown aerial roots, with persistent leaf bases towards the crown. The trunk apex and leaf bases are densely covered with glossy ginger-brown hairs up to 4.5 cm long. The numerous leaves are borne in a large, spreading crown. The leaf bases are warty or smooth, and the midrib bears sparse, long, brown, shaggy hairs. The leathery leaf blade is 2-4 m long, divided three times, dark green and shiny above, and paler. There is one sorus (structure bearing sporangia, which contain spores) per lobe. The indusia (flaps of tissue covering the sorus) are composed of two lips, more or less equal in size. Australian tree ferns are slow-growing - between 1-10 cm per year depending on conditions - and do not reach maturity until they are about 23 years old. Dicksonia antarctica is the most abundant tree fern in south-eastern Australia. However, collection from the wild and land clearance for farming from the end of the 19th century onwards have contributed to the decline of this species in many parts of Australia. 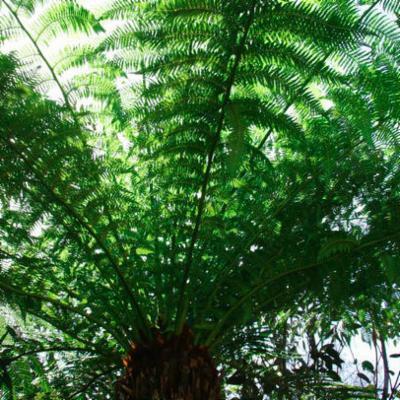 Its slow growth means that most of the commercially available Australian tree ferns are harvested from the wild. The majority of these are exported to Europe, Japan and the United States for the horticultural trade. Currently, most supplies of mature ferns sourced from the wild are salvaged from old-growth forest areas about to undergo a significant land-use change, such as clear-fell logging and conversion from native forest to plantation. 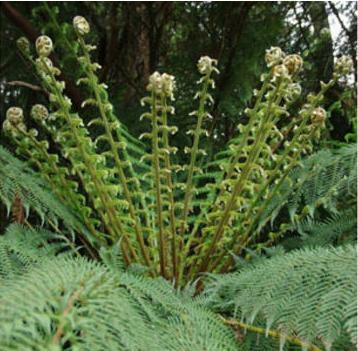 Dicksonia antarctica has a low survival rate in areas where there has been substantial disturbance, such as clear-fell logging operations that involve intense regeneration burning. An important implication of this decline is the effect on the role of tree ferns as keystone species in wet forests. Their low survival rate in clear-felled areas impacts on the many other species that rely on the habitats provided by tree fern trunks, such as epiphytic ferns and mosses which use the ferns for shelter or nest sites. Australian tree fern also forms an important habitat for the endangered Narracan burrowing crayfish ( Engaeus phyllocercus ). The crayfish live beneath the root mats of tree ferns growing in flood-bed regions of gullies in temperate, wet sclerophyll forests. Little is known about the impacts of forestry practices on these crayfish. However, it is thought that forestry activities may impose direct and indirect threats on them through habitat destruction from the creation or use of logging roads, and removal of vegetation. Australian tree fern is a popular ornamental in temperate areas. The pith from the centre of the trunk is rich in starch, and was once used as food by Tasmanian Aborigines. The uncurled leaves (croziers) are also edible, but have a slimy, sometimes bitter taste. The trunks are often used as a medium for growing epiphytes, particularly orchids. Trunks can also be used for fencing, while the central vascular material has been dried and carved to make craft items such as bowls and plant pots. 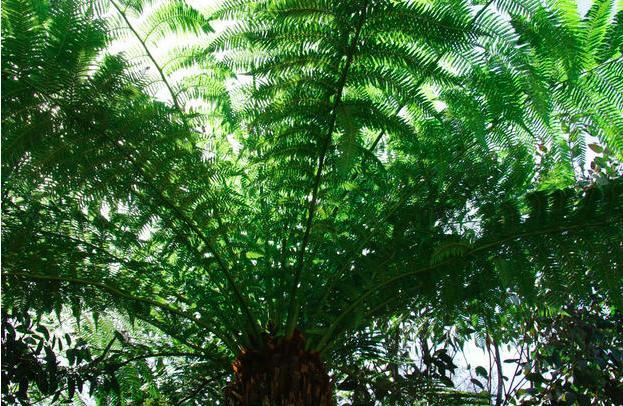 Popular in cultivation, the Australian tree fern does well in moist soils and grows best in humus. It is hardy in many situations. Dicksonia antarctica is usually an evergreen plant but may be deciduous in cold conditions. It tolerates high light-intensity to medium shade in both exposed and sheltered locations. It can tolerate light to medium frost but requires high levels of moisture or humidity in dry weather. The crown needs protection from frost in colder areas. Drought is generally responsible for most losses in cultivation. The crown should not be watered directly, as this can encourage rot. In general D. antarctica is easy to grow and can be transplanted with the fronds trimmed. Plants can also be grown successfully from spores, and are attractive as small ferns, even before they form a significant trunk. Dicksonia antarctica can be seen growing in the Evolution House, Temperate House and within the grounds of Cambridge Cottage at Kew. At Wakehurst it is grown in the Southern Hemisphere Garden and on the edge of the Water Garden. Preserved specimens of Dicksonia antarctica are held in Kew's Herbarium, where they are available to researchers by appointment. The details of an alcohol-preserved specimen can be seen online in the Herbarium Catalogue. Kew's Economic Botany Collection contains sections of the stem and heart (pith) of D. antarctica . Dicksonia antarctica (Australian tree fern) was one of 12 star plants featured in the Landscape, which took you on a journey across a whole continent, from eastern Australia's coastal habitat, through the arid red centre, to the western Australian granite outcrop featuring unique and highly endangered plants. Moist areas in wet sclerophyll forests, along creek beds, in gullies and occasionally at high altitudes in cloud forests. Widespread and common in high-rainfall forests, but not yet evaluated according to IUCN Red List criteria. A relict population in South Australia is now extinct. Doran, N. & Horwitz, P. (2010). Engaeus phyllocercus. In: IUCN 2010. IUCN Red List of Threatened Species. Version 2010.4. < www.iucnredlist.org> (accessed on 21 February 2011). Tasmanian Government: Department of Primary Industries, Parks, Water & Environment (2007). Dicksonia antarctica (notesheet). Large, M.F. & Braggins, J.E. (2004). Tree Ferns. Timber Press, Oregon. Ough, K. & Murphy, A. (2004). Decline in tree-fern abundance after clearfell harvesting. Forest Ecol and Manag 199: 153–163. Orchard, A.E. (1998). Flora of Australia, Volume 48: Ferns, Gymnosperms and Allied Groups. ABRS/CSIRO, Canberra. Spencer, R.D. (1995). A Horticultural Flora of South-eastern Australia, Volume 1. University of NSW Press, Sydney.